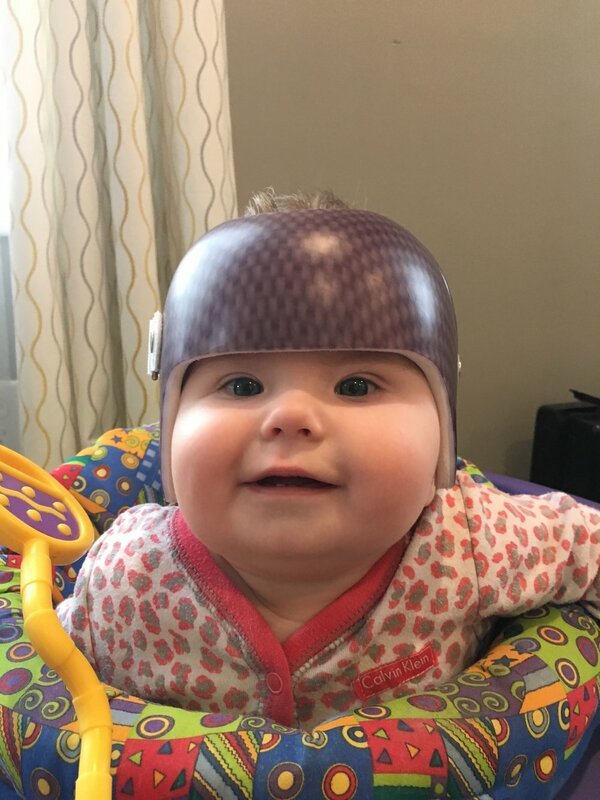 We did opt for the head-shape helmet. After our Florida trip, the measured her again and her shape worsened. We opted for the helmet, which is worn 23 hours a day. They expected slower results since she is older and don't recommend use after age 1. Her numbers have improved and are just a touch outside of the "norm." Fidelity tolerated the helmet well, and it was pretty easy to manage. She was definitely less cuddly when wearing it, so we are happy to see her hair again! She is constantly crossing physical milestones (although with some delay). She was rolling like crazy. She has a decent army crawl. We started putting her in a bouncer to strengthen her legs. She gets herself into the hands and knees position, but resorts to the army crawl if she wants something. She learned how to get herself into the sitting position. This seemed like it took her forever! She started doing this around 11 months. Immediately she began pulling up on EVERYTHING. Her fine motor skills have improved as well. She uses a pincher grasp. She grabs toys with both hands (and puts everything in her mouth). She is learning how to drop toys into a bucket. She claps and is starting to raise her arms above her head. Her eyes still cross, especially when she is tired, but she seems to have pretty good vision. She will look at me from across the room and start smiling if I make a face at her. I have been reading about surgery and vision therapy. She has not had her eyes tested yet, but it is something that is on our radar. Her bottle feeding... this one is tough. We asked for her to be evaluated for speech therapy and they rated her at 3-4 months when she was 9 months of age. The therapist watched her drink her bottle and shrugged and said, "She may never be great at drinking a bottle, we'll concentrate on solids." It is hard because it is so inconsistent. Somedays she will completely finish 4 of her 6 bottles, maybe only requiring 4-6 ounces through her g-tube all day. Other days she may refused to drink her bottle and require more like 24 ounces through her g-tube. I look for reasons. Is it teething? Is it that I am impatient? There are sometimes when I know she has the skill, but that she flat out refuses by crying, turning her head, pushing the bottle away with her hands, and kicking. There are other times that I can tell she is worn out, but I can distract her with a toy and she will finish. Around 9-10 months, she transitioned to formula. That has taken some stress off of me and the transition was pretty smooth. Food choices - Concentrate on the solids. This is kind of opening a can of worms. Food is such a huge thing in Prader-Willi Syndrome. As parents, we don't want to mess it up. "Food Security" means establishing good routine. They say "It's like a switch flips," so don't give your babies anything that you will have to take away. So many parents opt for zero sugar, zero sweeteners, zero white rice, zero white bread, zero white potatoes. But then, there are no true food allergies. Where is the line? It's kind of an emotional trap and there's a learning curve. Eating skills. Fidelity seems to be really interested in solid food. She does really well. She grabs things with a pincher grasp. She moves the pieces around in her mouth and does chewing and swallowing appropriate for her age. That is, until she tires out. Then she stops. My hope is that she will jump right into solids and we won't have to have the feeding tube. The truth is I think it will be a similar path to the bottle feeding. Her technique is fine, her stamina is lacking. Until "the switch flips" we can expect food aversions and all the struggles of having a toddler who is a picky eater. I have been looking up high calorie, low sugar foods like avocado, nut butter, refried beans, etc. Water. No luck here. They have started adding water to her feeding tube at the end of her feedings. We have offered it to Fidelity as a drink and she lets it dribble out of her mouth instead of swallowing. Drinking water is a common discussion in the PWS groups. How do we get them to drink it? Can we add flavor? Do we need to thicken it? Fidelity's disposition is still mostly chill and happy. She smiles and laughs and enjoys being around people. She will break out a loud cry now, and uses it more often. This is generally when she is very tired and wants to go to her crib. She will use her voice to emphasize that she wants her way by growling like Chewbacca. She does this at Mass when she wants to play on the floor and I try to hold her. Everyone loves her and she doesn't mind other people. Sometimes she will even reach out to be held. She passes as a younger baby since she is small and delayed in her development. People comment on her chubby cheeks and say, "looks like she never misses a meal." Coming up, we will be mostly concerned with keeping up the therapies to hit milestones. We may be in for some foot braces. These are usually just for the ankles once she learns to walk. I can see hers bulge a bit already because of her lack of muscle tone. We will probably get her eyes checked out soon. It is also common for babies to develop a curve in their spine once they start sitting. Fidelity's physical therapist is a powerhouse and tries to stay on top of these things, so they don't get too bad before we address them.